Do you want to make a comment? A site guestbook is here. Contact the webmaster here. Test, Test Copyright? The following article has been kindly written for the site by Len Charlton - to add to his many other site articles. Len has provided many of the images also, some of which are visible in a larger size with a click of your mouse. Otherwise, image sources can be found at the foot of the page. The term 'spa' originates from the Belgian town of that name famed for its chalybeate (iron-rich) springs. 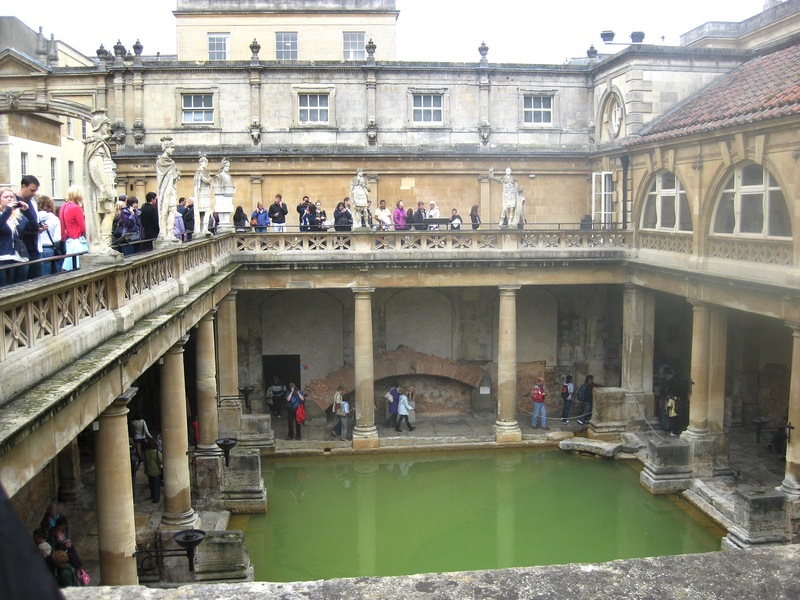 Many towns and cities owe their origin to such springs and to the pleasures of taking baths in their warm waters. In 1326, an eminent physician had shown that drinking from the spring also cured iron-deficiency - & 'taking the waters' became a regular annual event for the wealthy in Edwardian times. Social groups met one another to stay at one of the great spa hotels in Europe where they strolled around planning their day's appointments (which might well involve the ladies) while sipping the waters from the handles of highly decorative spa cups. There are several spa towns in the U.K. and indeed Bath, Somerset, takes its name from its old Roman Baths now restored in the city centre (above at right & lower left). Here, though you cannot today enter them, the waters are warm & relaxing, but as hydropathy became an accepted medical treatment in the mid 1700s, it was argued that cold water douches, fresh air and exercise were a better treatment and where better than the sea? This treatment, though much colder, could still be enjoyed according to Rev. William Buxted of Brighton, who, in 1736 wrote of his pleasure in 'sunning myself on the beach and bathing in the sea'. No doubt many genteel spa users would think this behaviour most vulgar. To bring Sunderland into this picture seems absurd but we must appreciate that in the early 1700s the Industrial Revolution was decades away, Sunderland, Bishopwearmouth and Monkwearmouth had a total population of less than 10,000 with trading and fishing on a small personal scale and largely restricted to the river banks, Here the sounds were of hammer, pick axe and shovel, the smells were of fire, timber and tar and away from the river the land was essentially agrarian with horses, windmills and watermills providing the power. Windmills of different types were numerous, the mills on Hendon Lonnen being of the larger tower design which stood on a brick or stone base used for inspection and loading. Most of the town was on the south bank of the river which, running towards the sea, became ever more densely populated until it reached the town moor into which the town was growing. The parish church of Holy Trinity pushed into the moor from the end of Church Street in 1719. But we must start even earlier in this history when there was no church there and the north east corner of the moor was known as Coney Warren. This was an area of scrub and sand dunes where the grassland merged into the sand and rocks and where the numerous rabbits at one time provided skins for local hat makers as well as meat for their table. On the large wild moor were three ponds & several streams crossed by simple footbridges. As they ran down to the sea the larger streams had formed cuttings & ravines in the clay subsoil and amongst these streams and cuttings a well had formed some time in the past which being used for drinking and bathing had acquired the name 'The Spaw' (spa well). The building of the parish church and burial grounds, adjacent to the moor in 1719, saw a drive to oversee and maintain the moor properly to which end 'grassmen' were appointed. Hedges, bridges & fences were checked - many were removed - & 'The Spaw' was enhanced with stone steps and a brick arch facing the sea. The well, shown below as x, is close to the sands in this 1737 map by an unknown artist - also marked are M (the moor itself), W (warren), S (sand banks), C (Holy Trinity church) & L (coble landing). Holy Trinity Parish Church was built in 1719 on the edge of the moor to serve the ever expanding population. In it's burial ground lie many of Sunderland's notables. It was built as a plain red brick building with a tower to which clocks were later fitted. There was a peal of 8 bells and a well-stocked library with writing desks & space set inside for a council chamber and magistrates court with new buildings for council offices built in Church Street. Later the town's first hospital and almshouses were built nearby with a fine assembly hall used for balls, theatricals and public meetings. These were all large buildings set in gardens, the assembly hall being a symmetrical brick building, with four tall arched windows and a central doorway approached by a flight of stairs guarded by iron railings on either side Together they formed a compact town centre alongside the moor which itself covered 48 acres. Sunderland was then a wealthy town with fine hotels and grand town houses in High Street East used or owned by land and colliery owners. Photos now available show many of these buildings in sorry state and most have now been demolished so one can only imagine the traffic of carriages & sedan chairs past Coronation Street to the hub of activity and pleasure around the Parish Church in the mid 1700s. Life was very different for those living behind the great houses in High Street East - where Low Street ran down to the river. Here were the crowded artisan areas and quays & an ample supply of lodgings and pubs, some of low repute, patronised by seamen awaiting their next voyage. Many well known local rogues and thieves, with their female followers, made their favourite haunt in the notorious Lowther's Hall Inn on the town moor. This pub was positioned high on a clay ridge alongside Lowther's Dene, one of three ravines running down to the sea - the ravine coming in useful as route by which to escape the attentions of the police and revenue men. High on the police list was highwayman John Drummond, who kept a mistress & his horse in Bears Head Inn, (later Ryhope Hall), a more suitable area for his activities. His apprehension for burglary at Lowther's Inn, some five years prior to his being hanged in 1730 for murder at Tyburn in London, pins the great days of the Inn to the first quarter of the 1700s. Lowther's Hall Inn was eventually closed by the police before its final dramatic and watery end (see 'The Legend of Lowther Hall' below). The wealthy old town attracted �a goodly number of visitors' including the Countess of Darlington, who often came �to enjoy the salubrious sea-borne breezes and take the healing chalybeate waters'. It was a busy scene perhaps even matching the season at Brighton, (left below), where some of the town's fishermen and their families even turned to bathing visitors for a living. Ladies were bathed by so called 'dippers' and gentlemen by 'bathers'. In both cases the subject was repeatedly lifted into and out of the water by the bather or dipper. This 'dunking' became very popular in Brighton (perhaps more for entertainment then medical benefit) and bathers and dippers continued to do very good business for many years. History does not relate whether the fishermen of Sunderland ever took to this odd sport (right above). Sunderland was however facing a serious problem. To prevent sands silting up the harbour, a south pier had been started in 1723, but this was causing the frequent heavy seas to attack the shoreline, submerging rocks and land under sand and water and, as the pier was extended, the problems increased. High tide waters were reaching ever further inland while storms periodically eroded into the higher grounds at the edge of the moor. Burnett's 'History of Sunderland' tells us that 'In 1771 there was a great flood in all the rivers of the north of England; at this time Newcastle Bridge was carried away and great damage done to the pier at Sunderland' and it seems most likely that this was the storm that broke up the cliffs and inundated both the Spaw and Lowther's Hall. Certainly in 1785, when John Rain drew his Sunderland 'Eye Plan', a portion of which is above, the coast line had moved back a long way. His map shows two gun batteries which had been built to protect the harbour from the French but not the Spaw which had been adjacent to these batteries. The guns were often inundated and rebuilt and one feels for the militia on duty who must have been very wet on occasion. Even more public ground was lost, in 1795, when the barracks were built on Coney Warren and by 1817 the Spaw and Lowther�s Hall, along with one of the ponds, and a herdsman�s house near what would become Barrack Street, had long been gone and the assembly rooms themselves had been moved to the Exchange building in High Street. Visitors were beginning to use Hendon as a spa and Burnett records 'As a bathing place, Sunderland, in the summer season, is a place of great resort. Numbers from the interior of the country embrace the opportunity of enjoying the benefit of sea-bathing. Lodgings are not dear, and easily obtained. A set of metallic and hot baths were established in the year 1821, near the moor: and at Hendon there are the most excellent hot baths, and a number of machines for sea-bathing, conducted and attended by Smith Graham'. The newly built Hendon Bath Hotel with its hot baths was south of the old moor but here were the beaches suited to bathing machines ( image of such machines, likely in Canada or Newfoundland). Hendon had become more of a seaside resort than a spa but the writing was on the wall. The world was changing as industry took over and the final blow came in the 1850s when the south docks were built on land reclaimed from the sea. As fully described in page 013, walls were built at low tide to hold back the sea, and excavated soil was dumped to form the new Hendon docklands. The east side of the town moor was now closed off with staiths, railways and dock walls and Hendon rapidly changed from a resort to densely packed housing for the workers flooding in while a completely new Sunderland town was taking root up-river at Wearmouth bridge. Way back in the early 1700s, when Regency Sunderland was developing as a resort, Roker was just an area of sand & rock adjacent to the Ham Sands, a major hurdle for shipping entering the harbour. The south pier had aggravated the build up of sand & river deposits & in 1786, after many temporary measures, a north pier was started to try to prevent this. A water colour dated 1839, (left below), shows fishermen on Roker sands with the pier now being extended even further out from the first cast iron lighthouse. (This is the lighthouse now preserved on cliff park). The picture is drawn looking southwards from the rocky outcrop on the sands called Holey Rock. On this rock a gun battery was mounted to protect the port, and a drawing of 1819 (right below) shows a very different picture of the beach as seen from one of its caves - perhaps it was a wet and windy day. Further up-river, Monkwearmouth village, which had originated around the ancient monastic church of St. Peter's, was slowly growing seawards. Roker and the lands further north were still just open ground apart from the occasional hovel but the village finally reached Roker in 1842 and the first terrace of houses to face the sea was built on the cliffs overlooking the sands. Here was an obvious place for an hotel to compete with Hendon Baths and part of Roker Terrace soon became the Roker Baths Hotel complete with hot and cold vapour baths and showers using water pumped up from the sea. The new hotel was also advertised as a spa hotel hoping to attract the gentry for the pleasures Jane Austen describes so well in her novels of that time. But it was not that easy, the gentry at Bath being of a somewhat different breed to the hard living industrialists of the northern counties and one cannot really see them taking the sea waters at Roker or strolling round Sunderland in a typical easterly gale. At the time there were, after all, no promenades, shops or parks to parade in, just a slope down to the beach on to which in a drawing of that time some 20 people have ventured showing little interest in the two bathing machines that were no doubt supplied by the hotel. Although visitors to the hotel could get to the beach down the ramp cut into the cliffs, Roker Terrace itself was a dead end apart from a path leading to a wide deep ravine through which Roker Gill, a stream originating in Fulwell hills, ran down to the sea. The ravine was a spectacular sight with its steep limestone walls riddled with caves and one side extending across the beach to form Holey Rock, entered by the sea at high tide. There are endless stories of hidden passageways and very early cave dwellers as well as later smugglers and occasional hermits setting up no go areas. The spelling of Holey varies but these stories do not suggest that the caves were particularly blessed. Pristine sands waiting development stretched from Roker past Holey Rock to Whitburn on the horizon (image below is 1857) yet little was done for 30 or so years and they remained largely unused (inset below) - until 1879 when the first horse tram route started a 16 minute service to Roker Terrace. The ravine was in land owned by Sir Hedworth Williamson who, now seeing a huge opportunity, donated it as a public park to the Corporation - on the condition that they would build a bridge over the ravine to extend Roker Terrace into a coast road. This would open up the resort & beaches towards Sea Lane & even further northwards towards Whitburn. Agreement was reached. The park & bridge across the ravine opened in 1880 as part of a major building project to use Roker Terrace as an upper promenade & build a new lower promenade running below the cliffs alongside the beach. New north and south piers had previously been planned to protect the old small harbour entrance & this alone required some of the beach to be turned into work areas with railways. It all took some 20 years & the photo at left clearly shows the north pier under construction & the upper and lower promenades, balustrades and steps completed with Lockhart's Cafe centre. The unfinished roadway (bottom) runs under the new bridge (off photo right) into the landscaped ravine in Roker Park & several visitors are strolling round to see the work in progress. It all seemed to make sense when, in 1900, Sunderland's first electric tram route was opened from the town centre to Roker and in the following year was extended to Sea Lane over the new bridge. In 1902, in an imaginative move, one of those brand new tramcars was festooned with 'electric globes' and decorations to celebrate the coronation of King Edward VII the large front destination board stating SUNDERLAND LEAD. The celebrations reached their peak the following year when the last stone was laid on the pier & the channel fleet gathered off Roker to celebrate the piers opening in September 1903. This was no small honour, the channel fleet's history went back 200 years and it was now being strengthened with the Majestic class battleships one of which, HMS Majestic itself, led the fleet to Roker. Sunderland's Mayor and dignitaries boarded the flagship to welcome the visit and no doubt felt both deeply honoured and very disturbed by this portent of the future. In fact there was a sad end to the visit when, as the fleet left Sunderland, the cruiser HMS Sutlej ran down a schooner the Charles Chalmers with the loss of four of her crew. The final ceremony on the pier ended three days of celebration with the decorated tram, now carrying the destination ROKER GALA, vying for attention with the firework displays and a great fair by the pier. Charabancs and special trains brought in thousands of visitors to see the fleet and marvel at the transformation of a small harbour into a major port and a deserted coast line into an attractive seaside resort. The 'Roker Baths Hotel' overlooked it all but, while prospering mightily, quietly changed its name & became the 'Roker Hotel'. With the advent of WW1, came sightseers interested in the naval guns & searchlights now positioned on the cliff tops as well as the frequent ship strandings. Many of these were caused by ships having first to enter the harbour through the new piers & then navigate the narrow old pier opening. Restricted wartime lighting did not help & many ships ended up on Roker Beach. And in the continual flow of dreadful war-time news from France, the 1915 loss of HMS Majestic, which had so enthralled Sunderland, was hardly noticed. The great days of Sunderland as a seaside resort really started after WW1. The naval guns were removed in 1922 and the site is today a seated resting area. Although the section of the old Roker Beach enclosed by the new piers was a warmer place to bathe, it collected dirt and refuse from the river outflow and the beach at Sea Lane now attracted more bathers although Roker promenade was still popular for entertainment, tea gardens stalls and shows with Holey Rock and its caves as a backdrop. Under the bridge was Roker Park with a fine Victorian bandstand and stage, a boating lake and bowling greens all set in fine gardens. Sadly Holey Rock, with its exciting caves, had become unstable after continual sea attack, and, after many caves were bricked up, the whole outcrop had to be demolished in 1936. In effect this increased the size of Roker Beach by adding another length of sand running to an old pathway down the cliffs named the cat and dog steps because, it was said, they gave easy access to the sea to drown unwanted pets. Here too was an area of rocks named the cannonballs, so called because of their very rare volcanic ball cluster formation which attracted great geological interest & school visits. A curious old photo shows the rocks with a group of four white dressed Edwardian ladies (one a child) all reading books (or sketching) & apparently attended to by three dark dressed teachers (or nannies). A photograph of the author as a schoolboy standing against a section of the cannonball rocks - which boys greatly enjoyed because at high tide the waves against the rock face forced periodic jets of water and air from a blow hole on the rock top. With luck this was accompanied by a rather loud 'farting' noise which caused much boyish glee and much discomfort to passing grown-ups. The cliffs here extended out to low tide mark with a promenade running round them to the fine long beach at Sea Lane which in the early 1930s was little more than a cafe in open fields. By 1935 'Sea Lane' which had been just a lane leading down from Fulwell to the beach had become 'Seaburn' & this year also saw the start of Roker's Annual Illuminations. 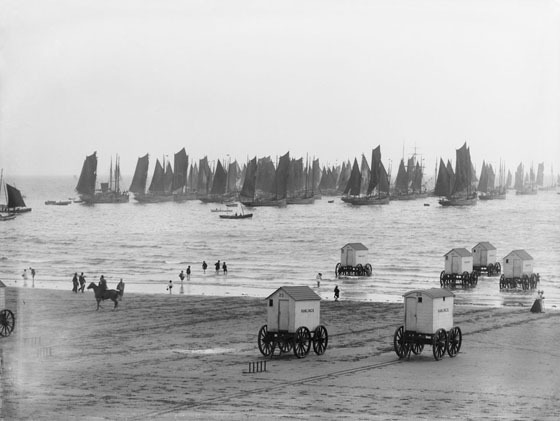 As Seaburn beach became more & more popular, holidays or hot weather would see an explosion of hired tents , picnics & 'paddling' in the shallows, swimming in the cold north sea being for the occasional enthusiast. Facing the sea, the old cafe disappeared, replaced by a block of shops alongside the Seaburn Hotel (at left), which hotel opened in 1937, and which became as popular for people going to the town centre on business as it was for holiday makers. Adjacent to the hotel, the road was widened to form a large roundabout and tracks were laid to enable the trams to go around in a continuous flow rather than queue to change tracks at the terminus. Close to the block of shops, Sunderland Corporation owned land on which they built Seaburn Hall - to be used for meetings, social services and dances. While a mixture of outside entertainments including roundabouts, stalls, miniature golf, children's railways and pools and, occasionally, full size circuses provided ever varying attractions. The trams were now in such demand that the Corporation opened a second tram route running down from Fulwell to a terminus adjacent to but not connected to the roundabout terminus. It all made for a very busy scene indeed in the late 1930s. The finest illuminations ever, claimed to be larger than Blackpools', were set up for August 1939 but were never switched on after war became imminent. A curious episode that August was the 'Goodwill' visit of the brand new German Airship Graf Zeppelin II which flew up and down the eastern coast. Although kept secret, it was a failed spy mission - the airship was carrying electronic equipment to search for radiolocation stations which although not identified were indeed in operation and tracking it. The following week the RAF demonstrated a new Sunderland Flying Boat over Roker and Seaburn which seemed a fitting response to the author who recalls his astonishment at the sheer size of the aircraft and who then little knew that two years later he himself would be in the army training as a radiolocation (later to be radar) engineer. After the war, council priorities were to clear up the heavy bomb damage in the town centre but a natural demand for some pleasure after the grim war years had to be met and the seaside soon re-awakened. Saturday night dances at Seaburn Hall started and were packed with demobbed ex-service men and women taking advantage of the free bus transport back to the town. It was the time of formal dancing to big bands and to Glen Miller melodies. Soon the illuminations' set pieces were brought out of storage, (at right), the annual shows were restarted and the funfair both rejuvenated and extended with new attractions including a miniature railway using a makeshift engine built from an old bus engine mounted on a tramcar bogie. The image below (to be added in) shows the train with Seaburn Hall and fairground on the right and the recreation grounds packed out with holiday makers - some of them in tents brought over from the beach. Posters, now combining the resorts of Roker and Seaburn, attracted visitors from further afield and the Seaburn Hotel expanded with new rooms and bars but still became jam-packed in fine weather. The hotel was also welcoming many new guests including the top stars performing at the Empire Theatre and the painter Lawrence S. (Stephen) Lowry who took several lengthy holidays there while drawing coastal and industrial scenes. He painted the (below) Sunderland river scene, 'River Wear at Sunderland', here & here, much later however, in 1961. However it all proved to be just a dream when during the late 1900s the collieries, shipbuilders and heavy industries began to close down, unemployment soared and the economy collapsed. Services were reduced & withdrawn. Seaburn Hall became a supermarket and the illuminations were stopped with the set pieces sold off. By the early 1980s, unemployment had reached some 20% of the workforce and increasing poverty & social problems including break-ins, theft and wide-spread vandalism became virtually out of control. Sunderland's fine parks, including Roker, suffered greatly in this very bleak period, and the image of a resort was forgotten --- this was the very end of Old Sunderland. Some two decades later Sunderland, now a City, started to regain its feet but it was a new very different world. Motorways, private cars and air travel moved people en masse to sports events, pop festivals and leisure parks and the old idea of 'a week at the seaside' in England was losing out to a cheap flight to sunnier climes. To survive, resorts needed to support these 'events' and Sunderland picked up the challenge and now organises many festivals of widespread interest one being the annual International Air Show at Seaburn which attracts thousands of visitors over two days every July. A slide-show of the 2011 event, with the image at right below, used to be accessible via this page. But no longer, it would seem. There are videos etc. available via this page, however. but not the 2011 slide show. It is no longer the Roker and Sea Lane of many older folk. But although they must miss Holey Rock, the coast is still there and if the weather happens to be fine at Roker and if you look VERY hard you may still see some children joyously paddling in the sea or looking for crabs on Cannonball Rocks. Len, we thank you for another fine article! Offered via eBay in Dec. 2012 were two souvenir programmes from the Sunderland Flying Club's air shows of 1967 & 1968 - i.e. 'Airday 67' & 'Airday 68'. The 1967 edition contained, I read, a history of Sunderland airport. It would be good, some day, to be able to show on site, cover to cover, all of the pages of such or similar programmes. And now we can show you on site, cover to cover excluding the blank pages, the 1967 programme shown at left above. The cover page is here. Move forward & backward via the buttons at the top of each page. All of the pages can be viewed in a larger size, by clicking each image. The two page history of Sunderland airport, penned by 'R. Henderson' (whom I invite to be in touch re my use of the text) & referred to above, has been diligently transcribed & follows. In the Airday 67 programme itself, it commences on this page. Many visitors to our Annual Air Day may be surprised to learn that Sunderland Airport formerly R.A.F. Usworth has been in use for over 50 years. The History of the field prior to 1930 is obscure, but permanent buildings were in existance during the 1914/18 war. In 1930, the R.A.F. began forming new Auxiliary Air Force Squadrons and Usworth aerodrome housed No. 607, County of Durham Squadron. 607 was a light bomber squadron, formed on the 17th March 1930 and didn't receive its full compliment of aircraft until the summer of 1933. These were Westland Wapitis single engine biplanes, powered by 550 h.p. British Jupiter engines. They became a familiar sight to Wear and Tynesiders, especially on the Empire Airdays and were popular with the week-end flyers of 607 squadron. 607 squadron operated the Wapitis until September 1936 when they were re-equipped with the Hawker Hart. On the 23rd, September 1936, 607 Squadron was re-designated to County of Durham (F) Fighter Squadron, still operating the Demon as a two-seat fighter aircraft until they received the highly manoeuvarable Gloster Gladiator in 1938. The Gladiators went to France in November, 1939, along with 615 Squadron and between them destroyed some 72 German aircraft. Whilst in France, the Squadron was requipped with Hurricanes. The squadron's losses were heavy in France, both as regards men and machines. In May 1940, they were brought back to Croydon to re-equip and then moved to Usworth, which in the meantime had been provided with concrete runways. It was from Usworth, that 607 squadron together with Spitfires from Ashington repelled the Germans big air raid on Tyne and Wearside. On August 15th, 1940, the Hurricanes were scrambled to intercept what was thought to be a small raid. It was mid-day and in company with other squadrons, 607 met not twenty, but over a hundred enemy Heinkels, escorted by seventy ME. 110's. In a running fight from Whitley Bay to south of the Tees, 607 Squadron destroyed ten German Bombers, and probably destroyed or damaged a further eight. All this without loss of aircraft or pilots. Usworth also operated Avro Ansons to train AI Operators in the new night fighter role, and pairs of these were often seen in the area, one acting as a target and the other as interceptor, as the trainee operators scanned their radar sets. At the end of the war Usworth reverted to a training role. No. 21 Reserve Flying was formed equipped with D. H. Tiger Moths and in 1947 Durham University Air Squadron moved in also equipped with "Tigers". Until the R.A.F. left Usworth in 1957, a remarkable variety of units used the airfield, including a Bombing and Navigational School (Airspeed Oxfords) and an Army Observation Unit (Austers). No. 31 Gliding School who trained many local A.T.C. cadets, Newcastle Gliding Club and even a balloon unit for the benefit of the T.A. Parachute Regiment. After 1957 the fate of Usworth hung in the balance until it was acquired by Sunderland Corporation. It now continues its service to the North East as a licenced Airport and the long tradition of Flying training is maintained by the very active Sunderland Flying Club. I understand that the airfield closed in the early 80s to make way for a Nissan car factory, a major employer in the area. And that the Sunderland Air Show has been scaled down somewhat in recent years due to its cost. The vendor of the 2011 edition of the Air Show programme (next paragraph) stated in his listing that the Sunderland Air Show is, in 2014, in danger of falling victim to budget cuts by Sunderland Council. Is that truly so? Tell me if you know. A copy of the 68 page 2012 Sunderland Air Show Programme was offered for sale via eBay in Mar. 2013, but did not sell. But it had a fine listing image! At right below. A copy of the 2011 edition was eBay available in late Jan. 2014. The listing image of its cover is at left below. A fine image indeed of the Royal Air Force 'Red Arrows' performing at the Sunderland Air Show of 2012. The image, which features prominently in Sunderland's events promotions, is, in fact, the work of Jonathan Kinnair, Assistant Media Officer of Sunderland City Council. Thank you Jonathan! I show below a portion only of the original image which was attached to a City of Sunderland Press Release. A half size version of the original image is here. And 'hot off the press' when this image was first placed on site - an image taken at the 2013 Sunderland Air Show on the weekend of Jul. 27/28, 2013. Of a Consolidated PBY Catalina flying boat flying low over the sea at Roker. We thank Ray Hutcheon for providing this beautiful copyrighted image, a larger original of which can be seen here. The Catalina was an American flying boat of the 1930s & 1940s - one of the most widely used multi-role aircraft of WW2. THE LEGEND OF LOWTHER HALL. From the knights of Normandie. That sails o'er Hendon Bay. With blood of Norman race. But who can gauge affection's power ? Low boy and high-born maid. Beneath the moon's pale glow. With nought but love on earth. Aye, long and long before. Rode slowly o'er its breast. Like foam, all in his wake. Was ever his mind before. Gleams on the lovers' sight. Across the deep blue wave ! The steel of a naked glave. His form cast in the sea! With shells of pearly white. In calm and soft repose. My call must be obeyed. Gather, each league, in strength and force. Avenge me for the slain !" Was heard the storm-wind's roar. The banks 'neath Lowther's Hall. Lay buried in the bay ! This legend of a Lowther family living in 'Lowther Hall' on Sunderland's Town Moor has the ring of truth in its very detail but it should be read as a legend. Certainly 'Lowthers Hall Inn' and ravine are well enough documented as is the fact that its criminal clientele nicknamed the disreputable landlady, who had also served time, as 'Lady Lowther'. Eventually closed by the police, the inn became derelict, and when it collapsed into the sea it was described as a 'derelict pub' and a "notorious inn". We cannot relate this to a great hall on the moor. There is indeed a Lowther family dating back to the mid 11th century whose family seat in the 1700s was 'Lowther Hall' - but this was in Lowther village in Cumbria near Penrith where the hall, later rebuilt as a castle, still exists on their extensive estates. Although at one time derelict, it was certainly never engulfed�by the sea nor was it the site of the bloody murder of the 'fair-hair'd fisher boy of Hendon Bay' and the revenge of the sea nymph who loved him so dearly. John Green wrote the legend in 1885 and his expressive poem has surely become intermixed with what actually happened in that big storm of 1771. SOURCES, where known to the webmaster or otherwise indicated, of images within 'Sunderland by the Sea'. The webmaster tries hard to find the very best images to illustrate the many articles on this site. I trust that it is in order for the images which are shown above, to be included in this informational & non-profit website. But .... if you are the copyright owner of any of the material included in this page, & would wish it removed, do please be in touch & I will gladly remove it. But probably with some regret! And probably I would wish to try to replace the material from a source which is acceptable. You can contact me here. 1, 2, 3 (a fine present day image of the Roman Baths at Bath, Somerset - do see it in full size), 4, 5 (donkey riding at Brighton), 6 (an engraving of bathing at Bridlington, Yorkshire - published in 1814 in 'The Costume of Yorkshire' by George Walker. See also here & here), 7 (a section only of John Rain's 'Eye Plan' of Sunderland. We thank Brian Hubbard for the fine image), 8, 9 ('Taken from the rock under Smithson's battery', an H. Collins print published in 1819 ex 'Pictures in Print'), 10, 11 (a print of Roker Baths Hotel, ex 'Pictures in Print', dating from the 1840s, modified by the webmaster), 12 (a tiny portion of a 'Birds-eye view of Sunderland', artist unknown, published in 1857, ex 'Pictures in Print'), 13 (ex 'Pictures in Print', of Roker, dated Feb. 12, 1858), 14 (a print 'The Cave of the Holy Rock, near Sunderland. ', dated Feb. 12, 1858, ex 'Pictures in Print'), 15, 16, 17, 18, 19 (an image of a 'Charles Dixon' 1901 painting of HMS Majestic), 20, 21 (a Wikipedia commons image of the sinking of HMS Majestic, at the Dardanelles, on May 27, 1915), 22 (a magnificent photograph of what would appear to be a public sign, see also here), 23 (a 'Roker Beach' postcard ex the Sunderland Libraries collection, much modified by the webmaster however. Believed to date from c.1900), 24 (Len Charlton family archives), 25, 26, 27, 28, 29 (a 1972 British Railways Poster, ex 'Science Museums Group' collection), 30 (Lawrence S. Lowry 1961 print ex BBC 'Your Paintings'), 31, 32, 33, 34, 35 (A splendid 'Mark Avey' image taken at the 2007 Seaburn International Air Show. Do not miss it in a larger size here), 36 (an image taken at the 2011 Seaburn International Air Show, thanks to 'The Journal' of Newcastle. But the image is not there any longer), 37 (a fine artwork by Robert G. Hutchison), 38 (bathing machines & the Herring Boat Fleet - image here), 39 (ex 'Pictures in Print' - a portion of a 1737 map by creator unknown), 40 (Holy Trinity Church, built in 1719, ex 'The Friends of Sunderland Old Parish Church'. Lots more to be detailed yet, but I am at the end of my knowledge as to the sources. A truly magnificent 'atmospheric' image of unknown origin. The webmaster found the image posted by Ray Hutcheon on the Facebook 'Sunderland in Pictures' pages - but enlarged the image for better presentation here. I cannot tell you where it was taken or when. Chris Herring comments that the photograph was taken at 14 Bridge Street. While Ronald Wilson suggests that it might have been taken at the bottom of Bedford Street with the Argo Frigate pub on the right next to the Sunderland Echo van. It may well be that by the time you view this page, more comments will have been added to that 'Facebook' posting. The image is simply splendid! Enjoy!